First of all, you should buy a long-sleeve crop top. There are so many interesting designs to choose from. Long sleeves will give you an extra warm. The great thing about long-sleeve crop tops is that you can wear them with a number of clothing staples. For instance, you can go for a solid, neutral color crop top and style it with bright print skirt or leather pleated high-waisted skirt. If the weather is really cold, then how about creating a double layered look? All you need is to wear cropped top atop your favorite T-shirt or collared button-down shirt. The result looks modern, preppy and original. If you are more into laidback look, then why don’t you try on crop top layered underneath your outerwear or cozy shirts. This is an easy combo that looks cool and downtown chic. 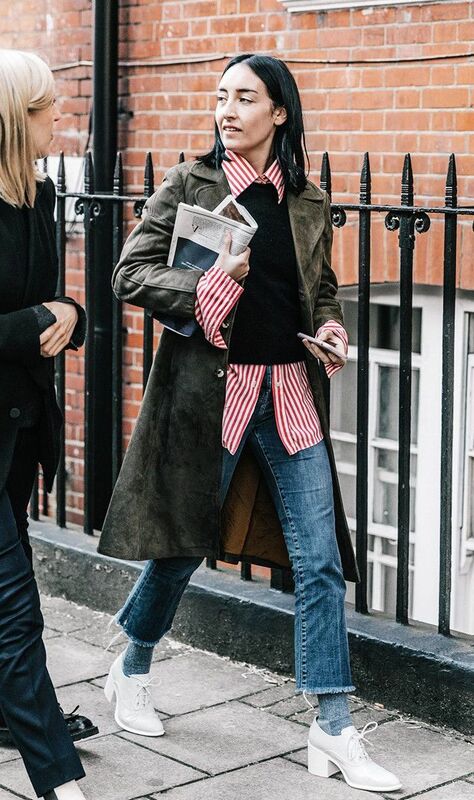 For instance, try on white crop top styled with red-black gingham shirt and black drop-crotch sweatpants or keep things more elegant by pairing striped crop top with high-waisted black long skirt and camel tailored coat on top. The last thing I wanted to mention is knitted or crocheted crop top. These fabrics are ideal for those ladies who wish to wear crop tops a little bit longer. The knitted crop top looks and feels very chic.